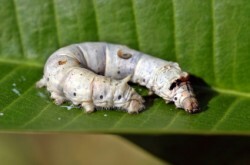 Silk is a delicate natural fiber that has been harvested from silk worms for thousands of years. To read more on silk, please click this link. Silk is a natural fiber used extensively in the manufacture of clothing. Unlike other natural fibers which tend to be plant-based, silk is actually a protein fiber that is produced by many different insects from caterpillars to spiders. When it comes to clothing manufacturing the most prominent and widely used source of silk is the mulberry silkworm whose cocoons are harvested to obtain the raw fiber. The reason for this non diversified sourcing of silk has to do with the molecular composition of the silk fiber itself and the fact that not all insects produce silk that is viable for the manufacturing of clothing and, of course, men's neckties. It is estimated that silk was first used as a textile component in China around 6000 BC. At that time silk was wild harvested from naturally occurring insect cocoons. Although the first uses of silk can be traced back to China there is no denying the fact that silk is a worldwide phenomenon and almost every culture across the globe has created their own unique process for creating regional silk out of insect cocoons that are native to their region. Today most silk comes from farmed colonies rather than wild harvested cocoons. Farm raised silk is considered superior to wild harvested silk do to the fact that it accepts dyes more readily as well as the fact that farm harvested cocoons are generally undamaged which results in a stronger finished textile. Another important factor is the fact that by industrializing the production of silk the price of the raw product is significantly reduced therefore allowing more people access to silk clothing. Silk is extremely popular in the manufacturing of clothing due to its many desirable characteristics. Silk is known to be one of the strongest natural fibers yet has a desirable texture (unlike most other strong fibers). When properly treated silk accepts dyes readily and has a natural luster that reflect sunlight in a desirable way. Additionally, silk is incredibly light weight and soft on the skin. Despite all the positive characteristics of silk clothing there are some negatives associated with it. Silk has a tendency to shrink after its first washing, is prone to static cling and susceptible to insect damage if stored improperly or in dirty conditions. However despite these negative characteristics silk is one of the most highly desired fabrics on the planet. It has a long history of being used by the rich, powerful and famous before finally becoming affordable enough for the masses in recent history. Today, while it is more affordable than ever to purchase silk clothing, there are multitude of synthetic fibers that have been developed to replace silk and offer consumers an inexpensive alternative with many of the same desirable characteristics. Rayon is perhaps the most popular of these synthetic fibers though others exist. For additional reading you may also want to read: Necktie Fabrics as well as our article on How Silk is Made.